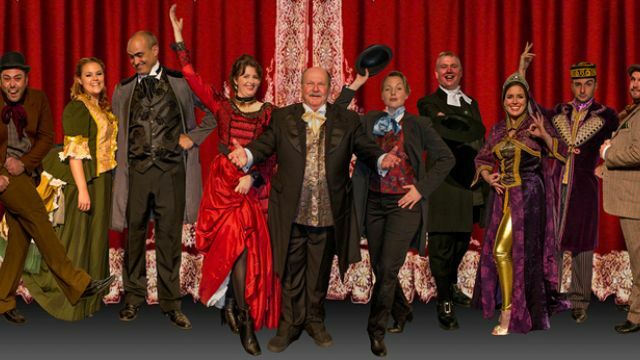 Bankstown Theatre Company is presenting The Mystery of Edwin Drood, amusical ‘whodunit’ which is loosely based on Charles Dickens' famous unfinished novel, in July 2014. Drood takes audience participation to new heights by letting them directly affect the play's outcome by voting for whomever they think is the murderer. Stage Whispers recently spoke with director Christopher Hamilton. What attracted you to The Mystery of Edwin Drood? When I first heard the album back in 1985 I fell in love with the music, and also having the audience vote for how the show would end seemed an intriguing device. Back in the days of vinyl LPs they could only include one ending, however for the recording they chose the ending that the audience selected on opening night – and that was Cleo Laine playing ‘Princess Puffer’ confessing to the murder of Edwin Drood. When CDs were finally produced the recording of the show was able to include all the possible endings. I was lucky enough to see the recent Broadway revival in 2013, and I knew that somehow I had to get a production staged. I’m not sure why more companies haven’t attempted this show, certainly in Sydney I know of only one production in 1994 by Phoenix Theatre, but I could be wrong. Maybe companies are daunted by the prospect of preparing several endings! The music, the lyrics and the book were all written by Rupert Holmes and the show won several Tony Awards. The music is a great mix of Music Hall style songs, soaring ballads, patter songs and stirring anthems. We have a great cast of music theatre performers who are relishing every moment of wrapping their tonsils around these fantastic songs. You are more well known for performing than directing – what’s it like on the other side of the footlights? Yes, I think this is about the 12th show I have directed. I love the creative process during rehearsals, discovering what the cast can do, shaping performances so that the characters come to life. This is only a small cast of 12 so it enables a greater focus from my perspective. It also helps that the Musical Director is my wife, Jayne Hamilton. We are obviously in constant communication which ensures we are absolutely on the “same page”. What will be the biggest challenge with the show? Well, clearly the different endings. All the actors have to learn a specific ending determined by the audience, and they will not know until minutes before hand if they will get to perform their ending. Everything else that you might normally worry about pales into insignificance when you have that to manage. The creative folk at Bankstown Theatre Company have pulled out all the stops for us. There are beautiful new costumes (bustles galore for the ladies! ), a magnificent “Music Hall Theatre” is being built to house the production and some special effects thrown in for good measure to keep you dazzled. The Mystery of Edwin Drood plays at the Olympic Parade Theatre, Bankstown from July 25 to August 3, 2014.